Here we are, the final blog post! It was fun to re-read my posts from the course of the semester and recall each assignment. In turn, I also recalled how I was feeling each week based on my tone and the subject of my blog posts. There were some assignments I enjoyed more than others and that was reflected in my writing because, with some posts, it was easy to fill a page while others required more effort. As I was reading, I kept attaching the emotions and feelings I was having to the weekly posts, so I decided to represent my semester through emojis the QUEENS of conveying emotions. Little known fact about me, I love emojis and find them hilarious. While I am not an over-user, I definitely send about one per text to convey just exactly what I am trying to say. And if I can’t find an emoji to communicate what I am trying to say, I am infamous amongst my friends for “making my own” and sending a selfie of me making a goofy face. Anyways, back to PR… I experienced a variety of emotions over the semester ranging from excited to confused to doubtful and discouraged. As the semester comes to a close, I am ending on a note of anticipation. I have already mentioned this, but I feel content with what I have learned in PR Pubs, but know I have a lot more to learn and room to grow. I felt I turned a corner after the direct mailer project. It was challenging and I had to continually learn new skills throughout the process of designing it with the cutouts and all. There were several days I was frustrated because I couldn’t perform the seemingly simple task that I felt soo close to doing. 1,000,000 questions later, I got it all figured out and in the end, I am most pleased with my direct mailers. They look nice and convey the classy, upscale tone of the Residential Colleges. I feel that OU could realistically send those to potential students if need be. All semester, I put my best foot forward although I am definitely still learning. My work was NOWHERE near perfect and some was lacking in quality/skill, but I do not feel that I slacked in any area. I am content with the amount of effort I put forth and pleased with my work. In conclusion, I was on a bit of an Adobe roller coaster this semester, Somedays I loved what I was doing and other days, just looking at the screen made me feel kind of cranky. Up and down, around a quick corner and back up a hill before the final descent to the loading dock. It was a grand time that FLEW by and I would be happy to ride again. 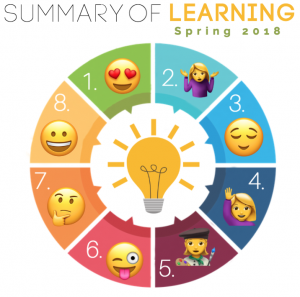 I hope that my summary of learning and the words I chose to represent this roller coaster ride, communicate my feelings throughout the semester. I hope I conveyed the growth and personal development I experienced. Thank you again for everything, Croom. You rock! !